T4Z 88HTA Ball Bearing Turbocharger. This turbo is built on the well respected T4Z frame turbo. Most people are familiar with this configuration as a T67 or a GT37R, both poor names that didn't really describe this turbo well at all. After all a T4Z is not a GT37, and calling out inducer diameter is sooo 80's turbonetics that I have to get my rubics cube out whenever I say it. 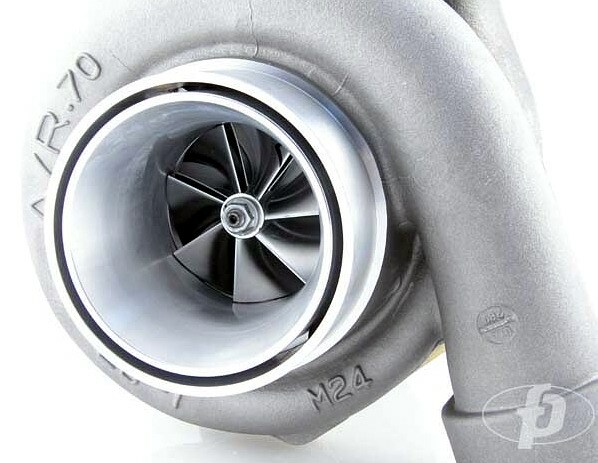 So now that you know that GT37R were really T4Z turbos, you likely have a better idea what this turbo is about. Our version ditches the t67 compressor wheel. That wheel was a 63 trim wheel that really left LOTS on the table when it came to high boost performance, giving only a max PR of 3.4:1 even at it's highest speed line of 120krpm. The HTA easily sustains PR in excess of 4.5:1 making 45psi or more boost pressures possible, consistent and dependable. The compressor housing is the familiar T4S cover with 4.0 Anti-Surge ported inlet and 2.5 outlet.